ADAPT... food	! gardening	! woodland	! energy	! transport ! enjoy living well today while safeguarding the future. 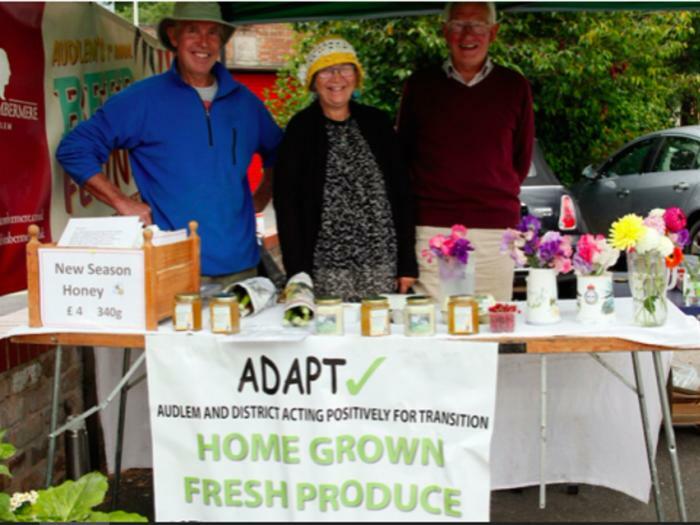 The name 'ADAPT' stands for Audlem & District Acting Positively for Transition. Groups meet, organise and carry out their own regular activities and fundraising for projects. Business meetings are held quarterly to share information between groups, coordinate activities, make financial decisions and discuss ADAPT policy and strategy. Good governance is supported by the Constitution and safeguarding policies and procedures. Our action and interest groups address these goals and have developed action plans. All groups consider how initiatives can create job opportunities, thereby contributing to the sustainability of the local economy. There is also a group working on a communications strategy — to make available information about transition and about ADAPT's activities. One of ADAPT's guiding principles is collaboration to avoid duplication and competition; another is networking to share knowledge and experience and avoid reinventing the wheel. Regional level: ADAPT has links to groups in the Low Carbon Communities Network. National and international levels: ADAPT can exchange with the wider Transition Network and learn from the sustainability experiments of a wide range of organisations such as the New Economics Foundation and Forum for the Future. ADAPT's current constitution was adopted at the Annual General Meeting on 7 December 2016.